Peanuts are a type of groundnut which belongs to the legume family and is related to beans. Convenient, crunchy and satisfying, peanuts contain protein and many essential nutrients. But eating too many nuts can have negative effects on your health. Too much consumption can cause some side effects of peanuts from the high-calorie and fat content, toxins and anti-nutrients. One of the disadvantages of peanuts, despite their contribution to your overall health, is their high-calorie content. Calories can make a difference if you're trying to manage your weight. A 1-ounce serving of roasted peanuts, which is equal to about a handful or 39 peanuts, contains 170 calories. Dietary Guidelines recommends a daily intake of 1,600 to 2,400 calories for adult women and 2,000 to 3,000 calories for adult men, depending on age and level of physical activity. That would mean a handful of peanuts accounts for 9 percent of your daily calorie allowance if you follow a 2,000-calorie diet. When snacking on a bag of peanuts, it's easy to rapidly exceed your calorie allotment if you eat more than one ounce. For example, just three handfuls of peanuts, which amount to 510 calories, would rack up more than a fourth of your daily quota. If you're concerned about your weight, another one of the disadvantages of eating groundnuts is they are also high in fat. Although you need fat in your diet, fat contains twice the calories of protein. Fortunately the type of total fat in peanuts, 15 grams per ounce, is mostly healthy mono- and polyunsaturated fats. However, some of that fat is saturated and accounts for 12 percent of your daily value in that ounce. Cutting out saturated fat and replacing it with the "good" fats is a healthier option. Saturated fat can raise total cholesterol and tip the balance toward more harmful LDL cholesterol, which may prompt blockages to form in your arteries, says the American Heart Association. For that reason, the Dietary Guidelines recommend limiting your saturated fat intake to under 10 percent of your daily calories. Peanuts are good source of phosphorus, with 113 milligrams per ounce. However, phosphorus in peanuts is in a storage form called phytic acid or phytate. Phytates are often referred to as anti-nutrients because they chelate other minerals, preventing your body's ability to utilize them. When you eat peanuts, the phytates bind with other nutrients and reduce their absorption. The most vulnerable minerals are iron, zinc, calcium and manganese. In addition, phytates reduce the digestibility of protein, and over time this can lead to mineral deficiencies, allergies and irritation of the intestinal tract, according to Humane Living. Phytates can contribute to mineral deficiencies, especially in young children or people with poor diets. You can reduce your risk by eating a balanced diet that includes all the food groups. But if you have a mineral deficiency, such as zinc or iron, limiting the intake of high phytic-acid containing foods is advised by the GI Society. Peanuts are one of the most common allergens and can cause severe, potentially life-threatening responses. A reaction to peanuts can be unpredictable, even with very small amounts. This results from your body's immune system, which identifies the peanut protein as harmful and triggers symptoms. Casual skin contact doesn't usually present a problem unless the affected area touches your eyes, nose or mouth. Unintentional cross contamination may happen as a result of food being exposed to peanuts during preparation. Read more: How Long Does a Reaction to Peanuts Last? Before you dig into that bowl of free peanuts at the bar, consider the sodium content. Many types of peanuts have salt and flavoring added that may have an impact on your blood pressure. For example, one ounce of salted valencia peanuts contains 219 milligrams of sodium. The USDA recommends you limit your sodium intake to 2,300 milligrams daily. That amounts to 1 teaspoon. Although you need sodium to balance the fluids in your body and help with muscle contractions and nerve impulses, too much sodium can negatively impact your health. The American Heart Association explains that extra sodium in your bloodstream pulls water into your blood vessels. The extra volume results in an increase of blood pressure, which can put an extra burden on your heart. Raw peanuts are naturally low in sodium and contain only 5 milligrams per ounce. So be sure to read the labels and opt for unsalted or low sodium varieties of peanuts. Read more: What Do High Sodium Levels Mean? Aflatoxins are a family of toxins that are produced by certain fungi found on peanuts. This type of mold is abundant in the warm humid regions of the world where peanuts are grown, harvested and stored. Since peanuts have a soft, permeable pod and grow underground as part of the plant's root system, they risk damage from temperature and moisture conditions. People can be exposed to aflatoxins by eating infected peanuts or even inhaling dust generated by handling them. Aflatoxin is a carcinogen that may increase your risk of liver cancer if peanuts are consumed over a long period of time, warns the National Cancer Institute. Aflatoxins are not entirely killed when peanuts are processed or roasted, so it can be a concern even in processed products such as peanut butter. Soaking, sprouting or fermenting peanuts can help lower the presence of mold. Buy only well-known commercial brands of peanuts and discard nuts that look moldy, discolored or shriveled. 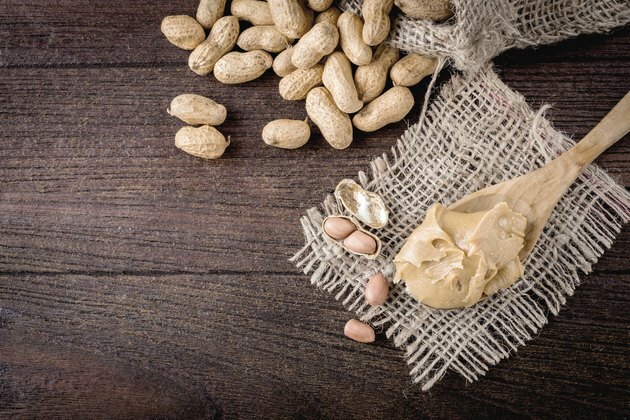 Any danger for Americans is minimized by testing done by the U.S. Food and Drug Administration for levels of aflatoxin in peanuts and peanut butter. But be careful about buying peanut products from sources overseas because not all countries have strict monitoring systems in place. Peanuts are high in omega-6 fatty acids with 4,361 milligrams per ounce. Omega-6 is an essential polyunsaturated fatty acid primarily used to produce energy in your body. However, omega-6 and omega-3 must act in combination and in the correct balance to be of benefit to your health. Peanuts lack omega-3 fatty acids. A dietary imbalance of high amounts of omega-6 to omega-3 fatty acids can increase inflammation. This may contribute to obesity, heart disease, arthritis and other chronic health problems, according to GB HealthWatch. The results of a study, published in Nutrients in 2016, reported that the omega-6 to omega-3 ratio plays an important role in obesity. Researchers found that a high omega-6 level led to an increase in insulin resistance and weight gain. The conclusion was that a balance of omega-6 to omega-3 in a 1-1 to 2-1 ratio was recommended in weight management. Peanuts can be a healthy snack as long as you make sure to include other foods that contain omega 3s in your daily diet to balance your fats. The American Heart Association: Why Should I Limit Sodium? Does Your Body Digest Peanuts? What Is Healthier: Dry-Roasted or Regular Peanuts? What Is the Nutritional Value of Peanuts?